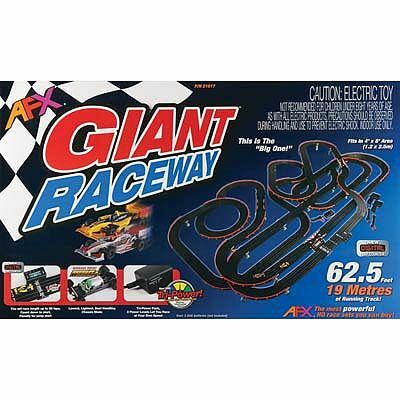 This is the Giant (MG+) Raceway Complete & Ready to Run Electric Slot Car Racing Set by Tomy AFX. Suitable for Ages 8 & Older. Retail $399.99 SAVE 30% ! 62.5 feet (19m) of running track. Includes everything you need to race. Tri-Power Pack - 3 power levels let you race at your own speed. Track fits in a 4' x 8' area.